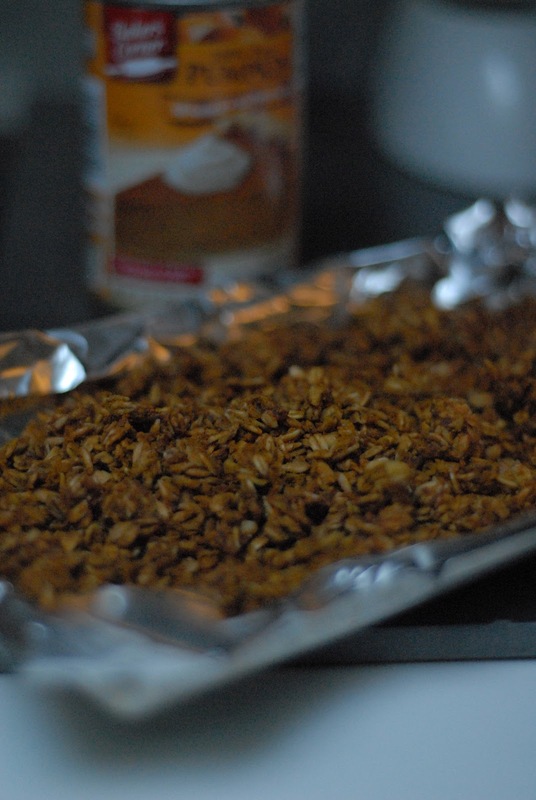 Seems odd, I know, but trust me, this is a delicious, seasonal, healthy granola! I love eating plain granola and granola in yogurt, but this tasted the best (for me) as a stand alone cereal with just a little milk. I love messing around with seasonal ingredients, especially pumpkin. It’s so versatile, I never cease to be amazed by all you can do with such a simple ingredient. Make sure you have set aside a morning/afternoon/evening where you are home and can pay attention to the oven before you set out to make this. 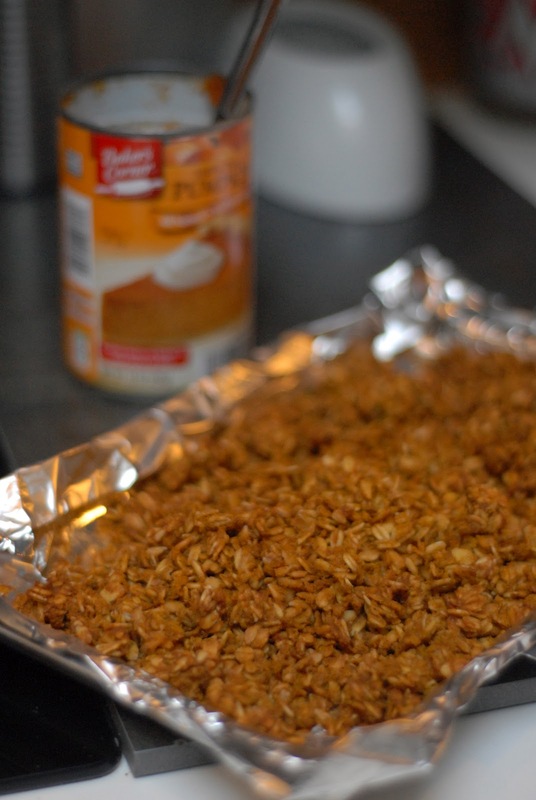 The wetness of the pumpkin gives this granola an unusually long cook time! And if you’ve ever made granola, you know you have to be pretty consistent with the stirring to ensure even cooking and more importantly, crunch! Preheat oven to 235* and line a baking sheet with parchment/wax paper. Mix dry ingredients. In a separate bowl, mix wet ingredients. Mix wet into dry until well combined. Spread mixture in a thin layer on the baking sheet with parchment paper. Transfer baking sheet to oven and mix gently with a wooden spoon every 20-30 minutes for about 3.5-4 hours. I know, the time seems absurd, but I couldn’t figure out how to speed it up. If you heat the oven too high, it’s almost too crispy and there was always some that burned! 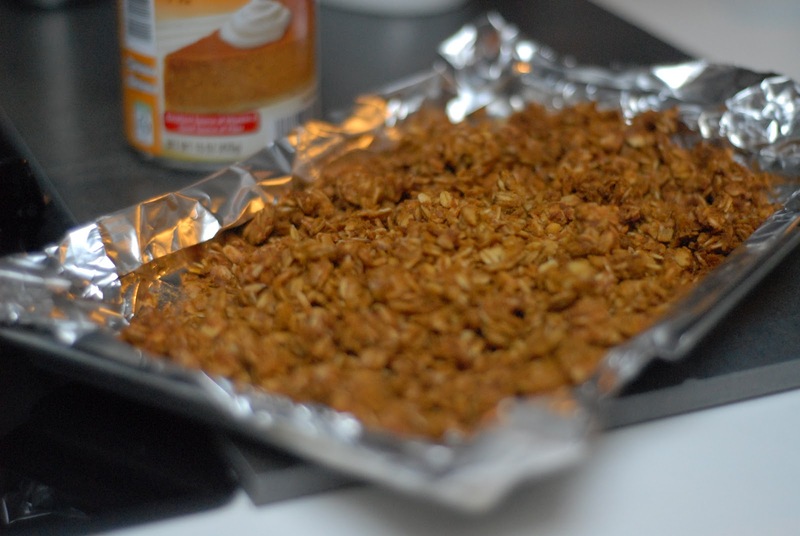 And the amount of pumpkin granola amassing in my kitchen prompted me to quit this endeavor. Let me know if y’all find a way! I’d love to hear it. IMHO, the coconut introduces a different texture and a cheweyness, depending on how long you bake, that I find enhance the whole experience. To that end, you could try raisins, always a favorite of Jens when I made it for her when she was but a wee girl, or sweet potatoes instead of pumpkin? Good job Jen! Haha, thanks mom! And thanks for the use of the kitchen!